We have Fresh Bronze Fuji Spider Mums available for delivery to the location of your choice. We guarantee the freshness of every petal of our Bronze Fuji Spider Mums. Our beautiful Bronze Fuji Spider Mums are cut fresh for delivery, ensuring that you will get the freshest Bronze Fuji Spider Mums possible. Used as table accents, gifts, and centerpieces, our Bronze Fuji Spider Mums can be fun and flirty amidst your event or space's decor. Our beautifully bloomed Bronze Fuji Spider Mums are perfect when given as a gift to brighten the day of that special someone. Feel free to order a bouquet of our Bronze Fuji Spider Mums from us today. 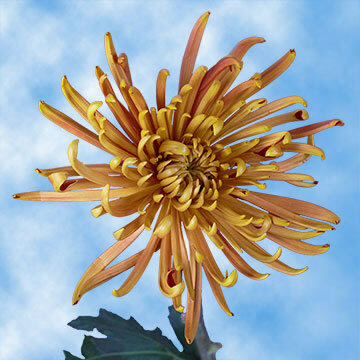 We offer free delivery for online orders of Bronze Fuji Spider Mums. Finding Bronze Fuji Spider Mums online can be quite difficult. We put quality care into making sure that we provide the best Bronze Fuji Spider Mums in our bouquets as possible. Our Bronze Fuji Spider Mums are cut fresh in our eco-friendly greenhouses in order to ensure that every petal will be intact when they arrive at your door. Order today!